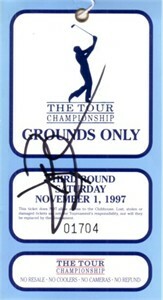 Original ticket from Saturday's third round of the 1997 PGA Tour Championship in Houston, won by David Duval and autographed by Duval in black marker. Has minor flaws and wear. ONLY ONE AVAILABLE FOR SALE.